“Well, guys, this is off-the-record,” began George, our guide and went on to share the kind of opinions about Greek society that outsiders are only privy to when they share a meal in the comfortable surroundings of a quiet restaurant in an obscure back alley- the kind that is found in every city but only known to the locals. I could let you in on the secrets, but maybe, just not yet. For somewhere between dipping into cool creamy taramosalata and sipping on refreshing Tsipouro, listening to George talk about what it means to be an Athenian today, I slipped out of my role as a travel journalist and listened, not necessarily to report, just as George had slipped out of his role as an expert guide on Greek food and begun to share his thoughts on Greek politics, culture and the economy. That’s the thing I love most about food- a good meal can make friends and confidants out of people who were strangers not too long ago. 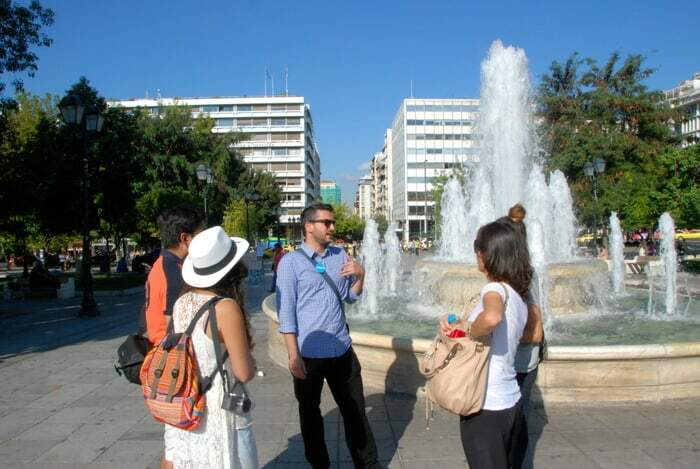 We had first met George early that morning at Syntagma Square. 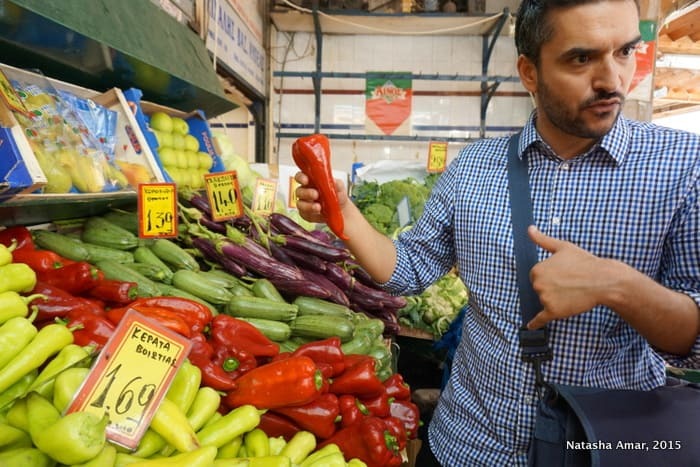 A chef by profession, he was our guide on our culinary tour of Athens with Athens Insiders. 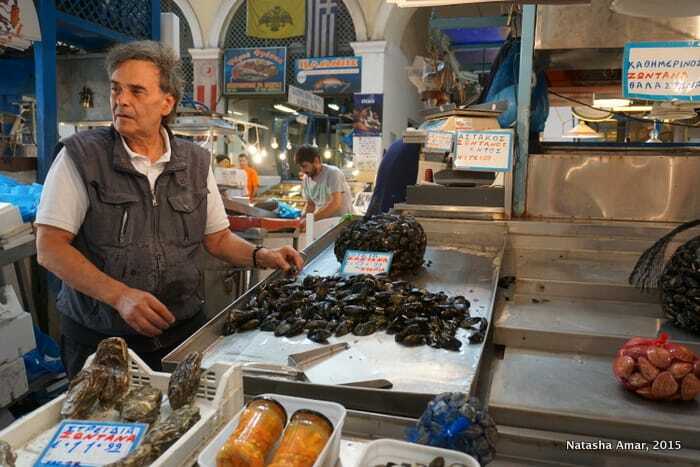 Both friendly and knowledgeable, George made for the perfect guide, talking as passionately about culinary traditions as only a chef can, and bringing to us the secrets of Greek cuisine that outsiders rarely have access to. 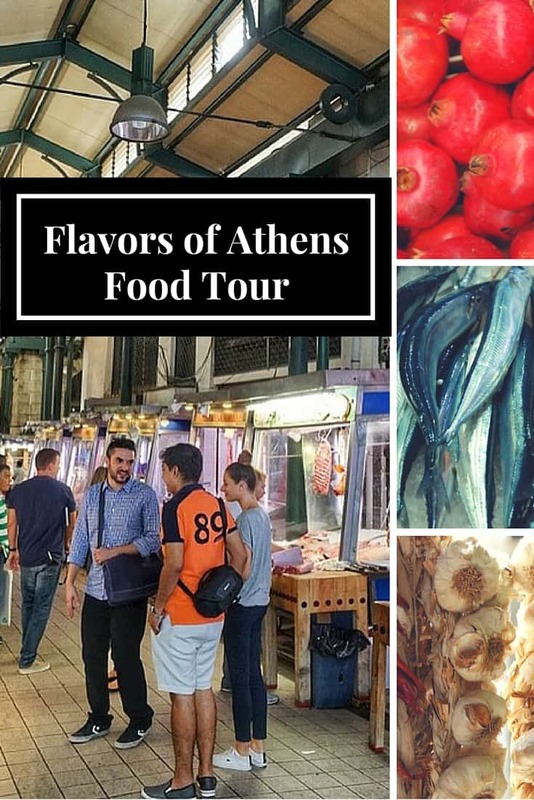 The Flavors of Athens Tour is easily one of my favorite things to do in Athens and if you’re headed to the city, I highly recommend taking the tour at the beginning of your trip, so that you can make well-informed food choices and seek out authentic cuisine during your travels in Greece. 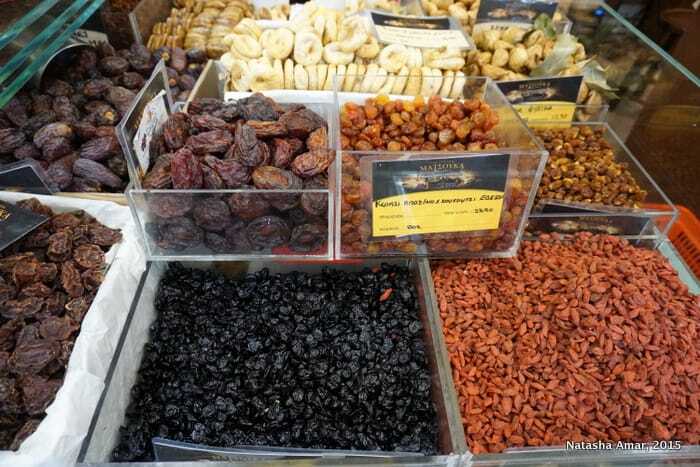 Our journey began at a store selling pulses, nuts, dry-fruits such as figs, and Turkish delights. Figs, as George explained, are widely used in local cuisine, not only in dessert and salads (as are nuts), but also in other cooking to prepare sauces when combined with wine. Their use in the cuisine dates back through the ages- in ancient Athens, harvested figs reserved for athletes were left to dry in public squares and stealing them was a serious offence. 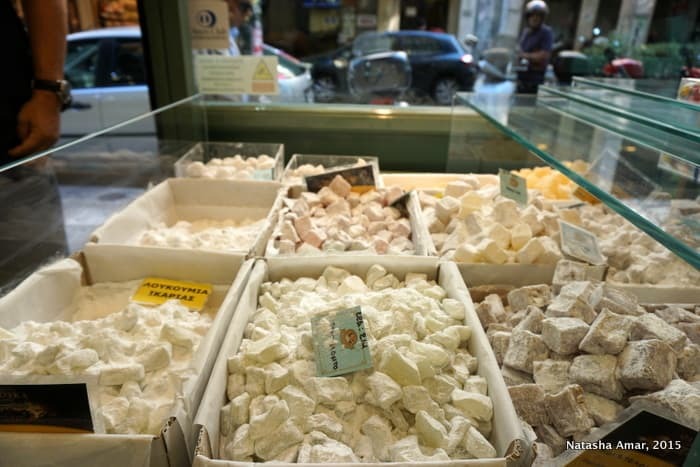 He encouraged us to try the incredibly sweet Turkish delight and I popped one into my mouth, completely forgetting about my painful cavity. The next thirty minutes were a constant battle between the throbbing toothache and the satisfaction of the sweet treat. 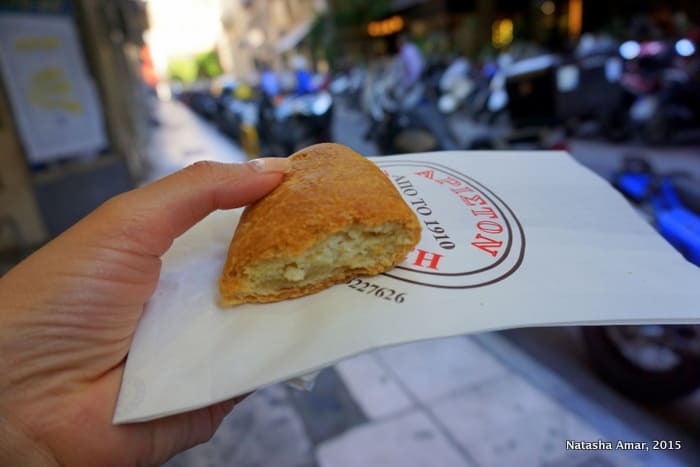 If you’ve ever been to Athens, or anywhere else in Greece, even if for just a few days, I’m sure you would have noticed that pies are everywhere! 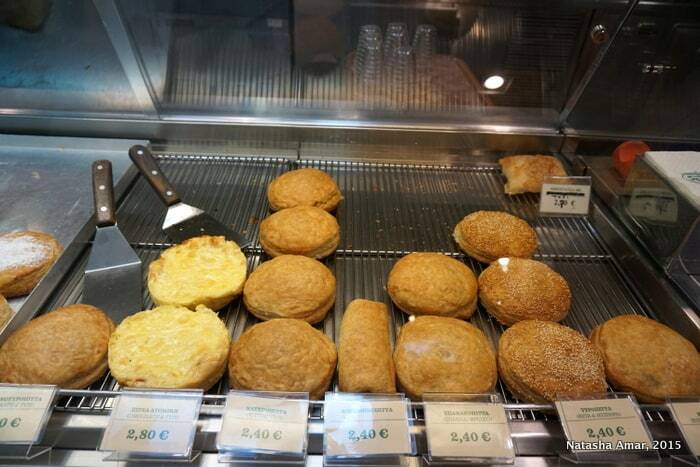 Not that I was complaining- because they were all delicious- cheese, spinach or meat, but I was curious about why pies were all we could get for breakfast at local establishments that weren’t geared towards tourists. And we’d seen locals eat pies for lunch, dinner and even as a mid-day meal. Our next stop would shed some light on this. We followed George into a pastry and pie shop that was set up in 1910, and smelled as heavenly as only a shop full of freshly baked pies can. Our take-away was ready and we stepped out on the busy street to gather around George, and listen to the history of pies in Greek culture as we relished kourou or goat cheese pie- perfectly crusty on the outside and soft within. As it turns out, and as is often the common story behind popular go-to dishes, the humble pie is a product of the creativity of those with meager means. Even the simplest of homes would have dough and olive oil in the kitchen, and adding some cheese, vegetables, eggs or meat into the pie to make a complete meal meant a full tummy and a happy heart. 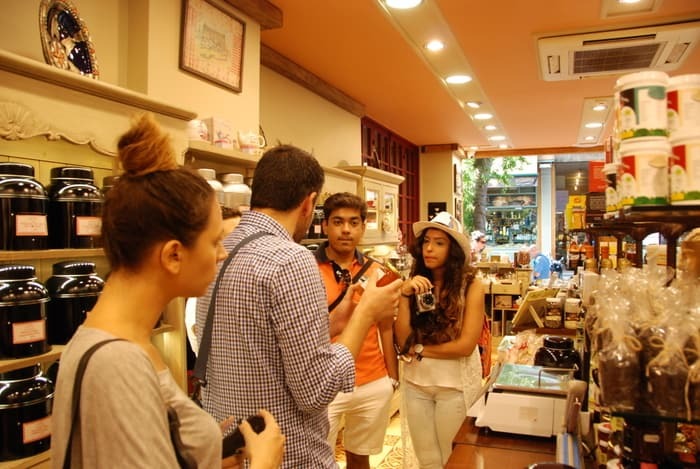 After a quick stop at a traditional bakery, we arrived at the oldest café in the city center of Athens, set up in 1871. 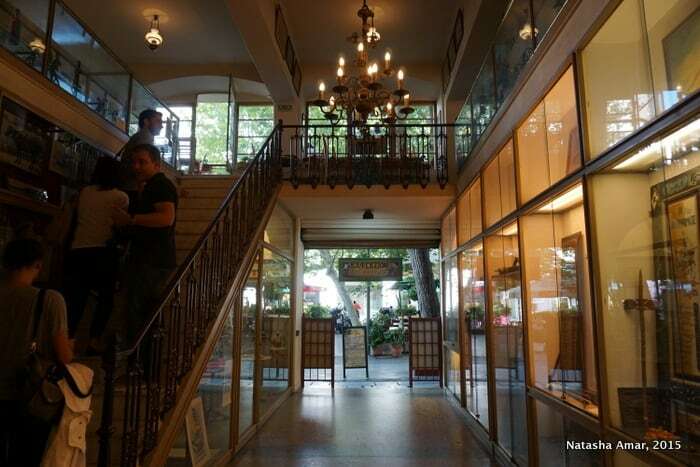 This traditional coffeehouse, located on the first floor of a building in the Monastiraki area, oozes character and is perfect for spending away an afternoon seated by the windows offering a view of the Acropolis and drinking coffee. 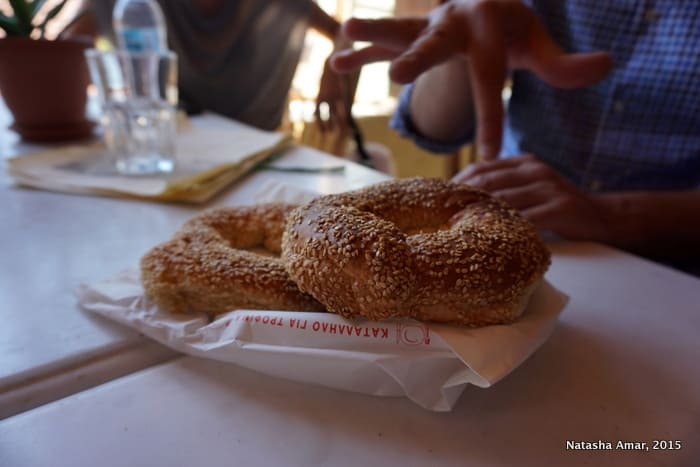 Here we tried koulouri, a round sesame-covered bagel, that we’d also seen in Istanbul and called simit in Turkish. Here’s a short video of the highlights from this tour- feel free to give it a thumbs up, share and subscribe to my channel. Or feel free to move on and read the rest of this post. Our next stop was, as George described, “the kind of place where you see a lot of elderly people enjoying sweet treats all by themselves.” We looked around to see he was right! 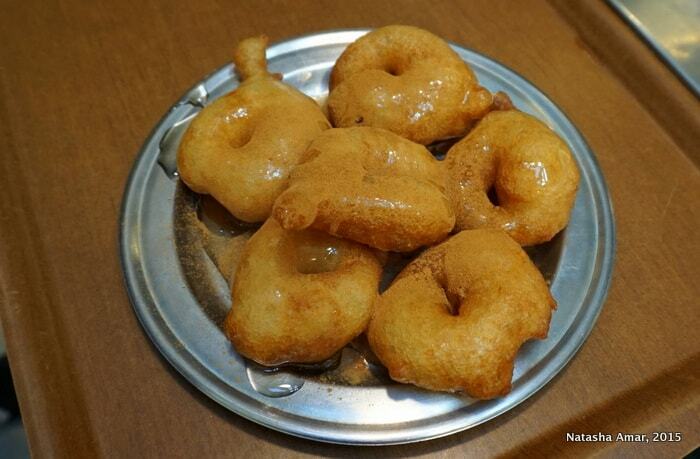 We got on with it too as we tucked into loukoumades, donuts that were crispy on the outside and light and airy on the inside, sprinkled with cinnamon and dunked in sugar syrup. We found ourselves in a large, bustling and noisy market, standing between rows of bloodied meat hanging on both sides, and butchers in blood-stained white aprons calling out to us. 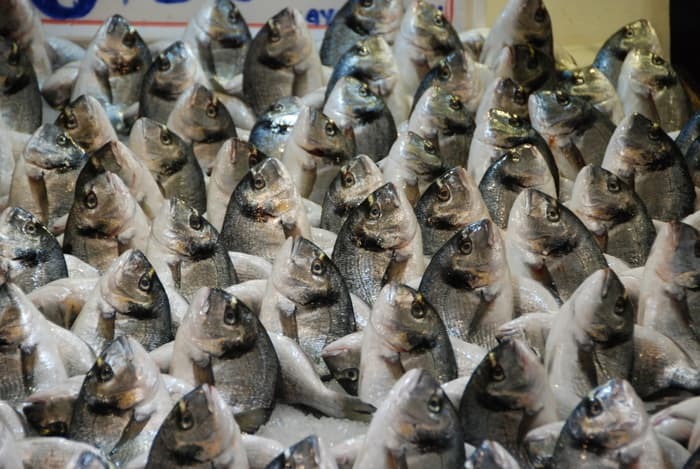 “It’s the smell of death,” said someone from the group and a few people decided to skip heading to the seafood section, which in fact, was a lot less gory. 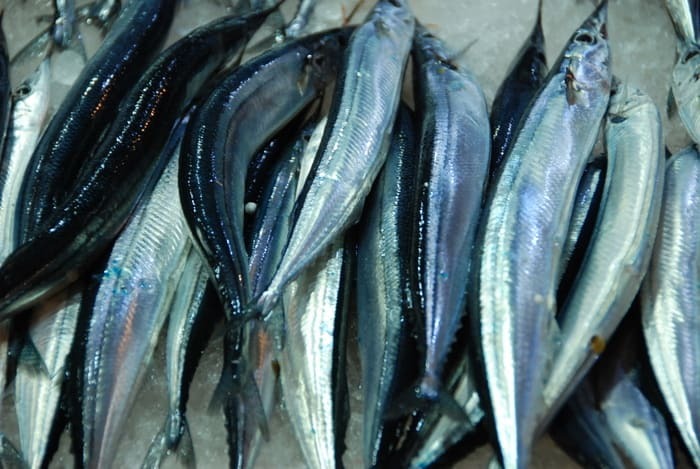 Swordfish, eel, clams and salmon were just some of the varieties we saw here, and my amusement was rather piqued by the loud banter of some of the fishmongers who I had no doubt, were saying things I didn’t want to know! Reunited with the rest of the group, we then headed to the vegetable market, its colorful displays a welcome sight after having walked through the butcheries. Our final stop was the lovely little restaurant I mentioned in the beginning. 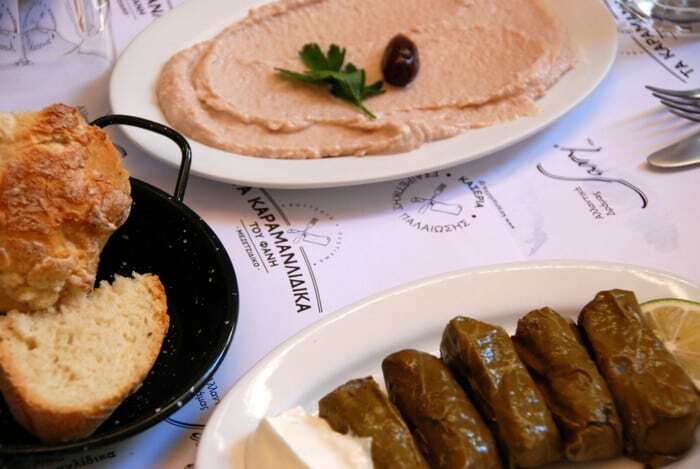 We dipped bread into different mezze, my favorite was taramosalata, a cold dip made of salt cod, roe, onions, tomatoes and olive oil, and tasted dolmades, vine leaves stuffed with rice, and an assortment of cheeses. But it wasn’t the meal here that I enjoyed most, the refreshing Tsipouro, a strong distilled spirit with about 40% alcohol, or even the delicious honey drizzled Greek yogurt, but the rare insight I got into a local’s view of the state of the economy and the country’s politics, and the stories about growing up and living in Greek society. 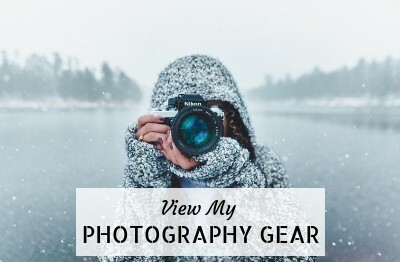 Curious about what I learnt? Well, you’ll just have to go on a Flavors of Athens Tour to find out. 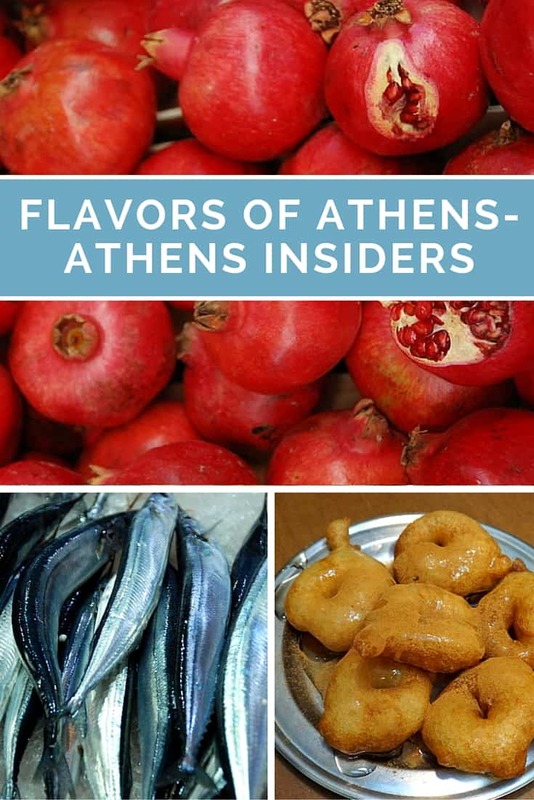 Information: The Flavors of Athens Tour is a four-hour walking tour with enough tastings to replace lunch. Meat preferences and vegetarian requests can be accommodated and need to be communicated in advance. 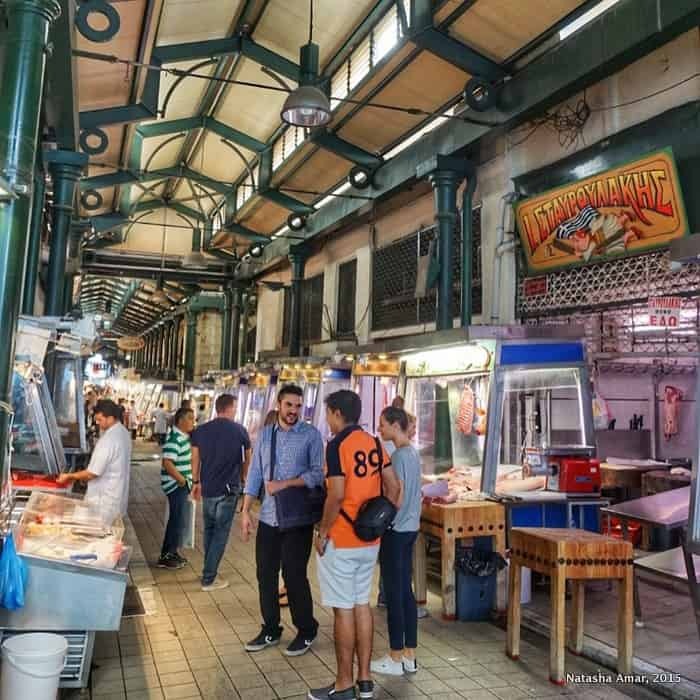 Tip: If you do go on this tour, ask your host for recommendations for places to eat in Athens, we followed a couple of George’s suggestions over the next few days and found that these restaurants were where we had tasted the best and most authentic food in Athens. The food is a lot more than gyros and souvlaki (which are both delicious), so be sure to discover that. Also visiting the Greek islands? Here’s how to go from Athens to Santorini. Disclosure: We were kindly hosted by Athens Insiders on this tour. All opinions, as always, are honest and independent. 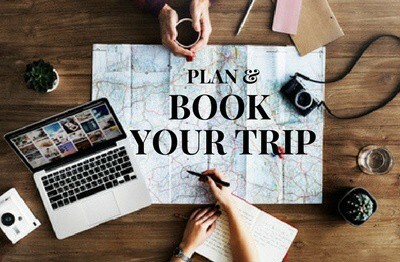 Connect with Athens Insiders on Facebook, Twitter and Instagram. 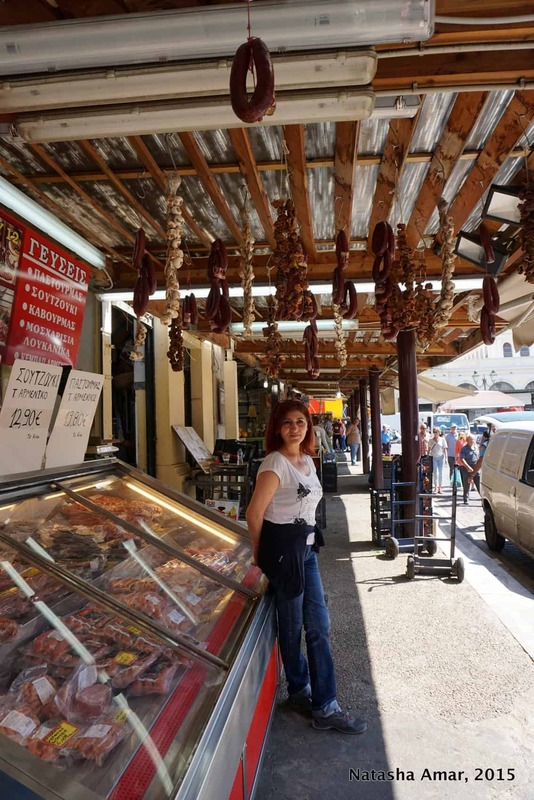 I had done a similar food tour when I was in Athens and I absolutely loved it. 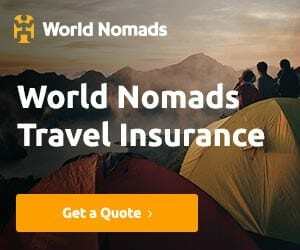 You’re 100% right – the conversations you have with your hosts are amazing and they give you so much insight into Athenian life. 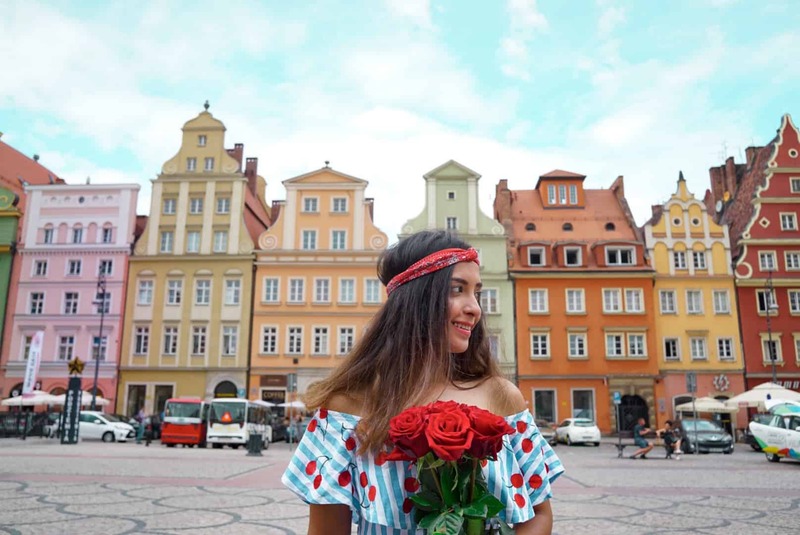 I really recommend doing the food tour on your second or third day in the city – you have a day or two to get over jet lag and get your basic orientation and then you can really get to know the city. 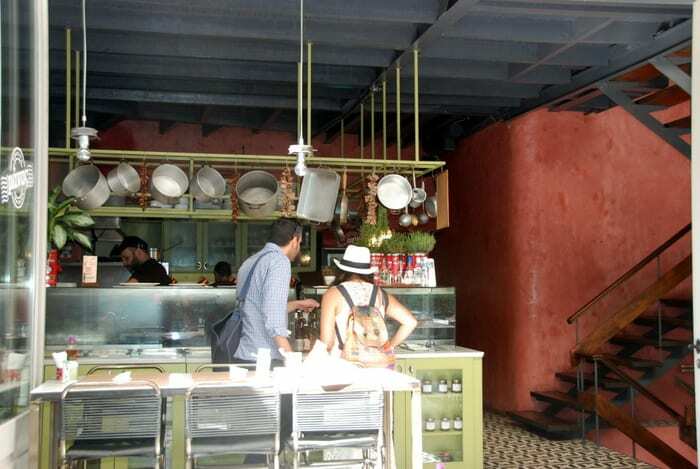 The food tours take you to neighbourhoods you might normally never discover! Good advice Vanessa- and I totally agree. 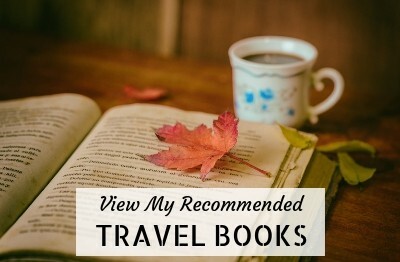 And having a few days left after the tour we were able to return to some of our favorite stops and try out their other recommendations. 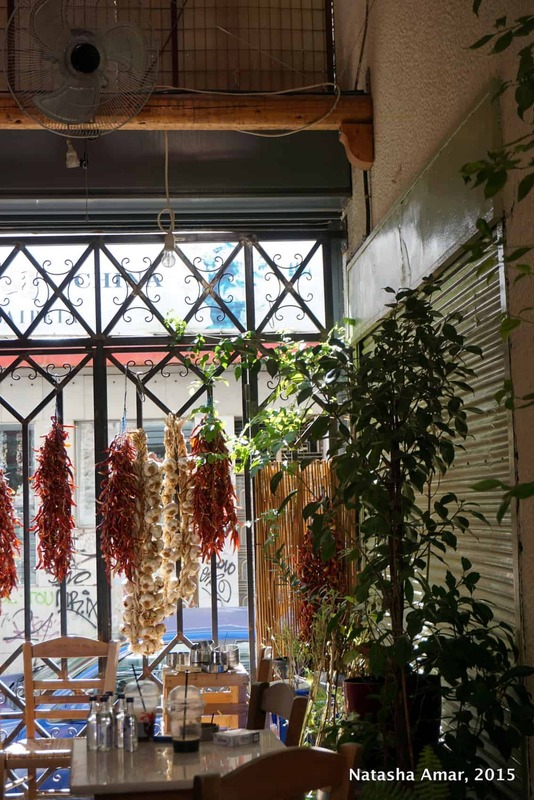 I’d love to see Athen’s oldest café–how cool is that?! And wow, the market you went to is gorgeous. There seems to be so many places to get good food there…I think I need to make a trip there asap! The city (and the country) is great for food lovers! 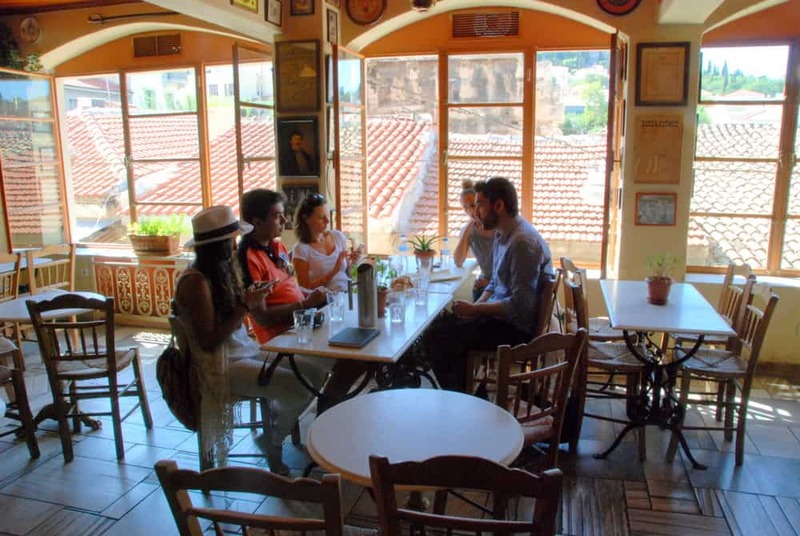 And the oldest cafe in Athens is totally cool to hang out in. Mmm, what a fantastic and tasty way to learn more about the culture of Greece! I have never been on one of these food tours but maybe we should! I recommend it Nic- great way to learn about local food. MMMM I like the look of the cheese pie! Oh my – that compilation of food looks amazing! So delicious 🙂 I spotted some dolmades, one of my favourite Greek cuisines! What a great tour! We go on a lot of food tours and never have we had a chef as our guide. That’s really impressive. I’ll keep this company in mind for when we inevitably do a food tour in Athens. The dolmades and hummus looks so good. Pies are widely available everywhere in Greece and they’re so delicious. 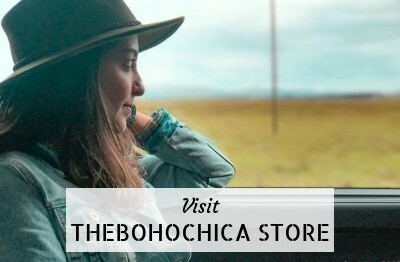 And looks like you’ve visited some great places! 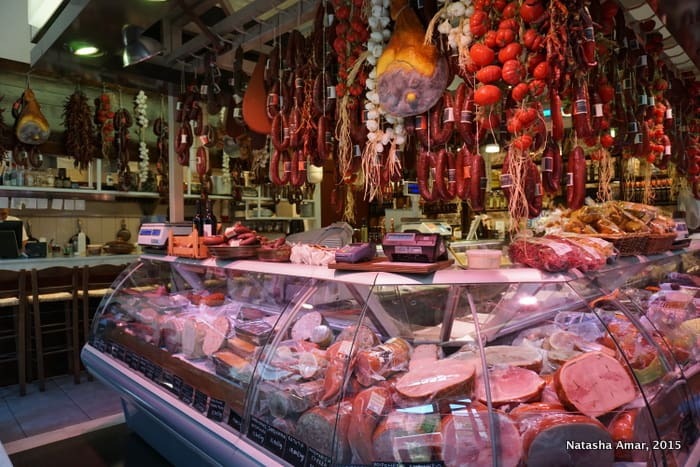 I did a similar Athens Food Tour with Viator a few months ago. Wasn’t it fun trying all those awesome native foods? My guide did not give us fresh figs but I did have some while there and in Bulgaria and Turkey. Nice way to get a great perspective on the local food scene for a cheap price. 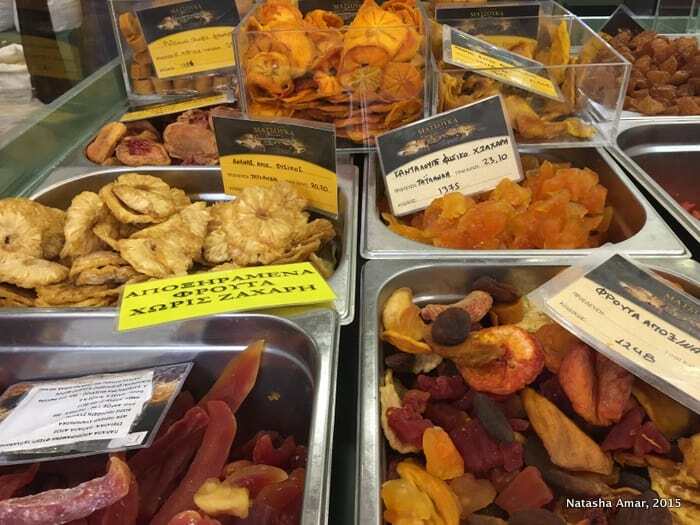 Athens looks great – and don’t you think food tours are a wonderful way to get ‘under the skin’ of a city. The fish pictures are stunning! Looks great – and don’t you think food tours are a wonderful way to get ‘under the skin’ of a city. The fish pictures are stunning! I do think they are a great way to do that. Thanks for the comment Fiona! This looks all soooo yummy!!! Great post, it makes me wanna go there now!! Love this post! 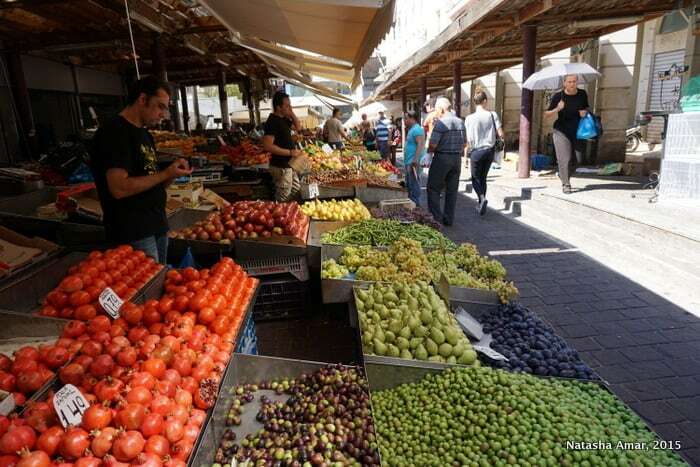 I am always been fascinated by markets and food – it teaches us a lot about the people and their culture. Interesting! 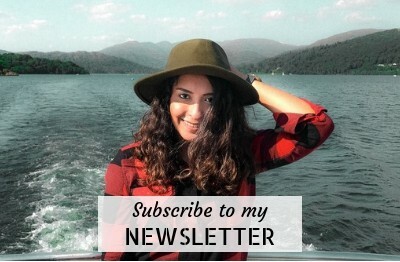 I am always been fascinated with food – it teaches us a lot about the people and the culture 🙂 Thumbs up to this article! Tiropita, dolmades, keftedes, pastitsio, makaronia me kima… I have been to Greece many times, and having had a Greek boyfriend for a long time really helped me in getting completely addicted to Greek food. Ohhhh I love it! I don’t blame you Claudia, Greek food is delicious! Love me a good market and this one is absolutely droolicious! Thanks for sharing the insider secrets Natasha! Pies always remind me of home, cool looking tour! I had never had as many pies in a month as I did during my trip to Greece, but I loved them. You have just inspired me to go on Flavors of… Tours in every city we go to. Seems like the best way to not miss on the best of local cuisine! Thanks. Totally agree- it was delicious! Wow! I knew Athens is such a great place but this post proved it more. Will dfinitely not miss the oldest cafe. Thanks for the nice comment Jessica!